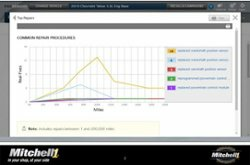 Mitchell 1 has enhanced the search engine in its award-winning auto repair information system, ProDemand®, to deliver relevant information from its interactive community of users, along with OEM-sourced content and SureTrack® real-world insights. When a technician types in a code, component or symptom into ProDemand, the software’s advanced 1Search Plus search feature now delivers related community trends to the search results screen along with OEM information and SureTrack Real Fixes for the selected vehicle. The trends include posted questions with answers or posted fixes based on discussion threads in the SureTrack Community module in ProDemand. The SureTrack Community includes over 10 years of posted fixes and community discussion. In addition, the Community module has a new, default filter that allows technicians to view only the community threads that are related to the current vehicle. When navigating to Community, technicians first see threads related to the vehicle they are working on, but can toggle to All Vehicles to get a view of community threads for all year-make-models. ProDemand provides complete OEM repair, estimating and maintenance information and exclusive real-world industry insights in a single lookup to help technicians repair vehicle more efficiently. 1Search Plus returns information in a user-friendly graphical “card” layout aligned with the way technicians think about diagnosis and repair. Key features include expert-based Real Fixes, ADAS quick reference, scalable color wiring diagrams, the latest TSBs, common repair procedures, Top 10 Repairs dashboard and integrated estimating with the Mitchell 1 Manager™ SE shop management system. Headquartered in Poway, California, Mitchell 1 has been a leading provider of repair information solutions to the motor vehicle industry for more than 100 years. Mitchell 1 offers a complete line of integrated repair shop software and services to help automotive and commercial truck professionals improve productivity and profitability. ProDemand® optimized with SureTrack® is the most complete solution for OEM and real-world repair information and diagnostics. Manager™ SE is the industry standard for mechanical estimating and shop management information. The SocialCRM shop marketing service delivers automated marketing and customer engagement tools to help shop owners improve their bottom line profits. For the commercial trucking segment, TruckSeries provides information required to estimate labor times, diagnose and repair all makes of Class 4-8 trucks. Mitchell 1 is a recipient of the ASE Blue Seal of Excellence award and was recognized by Frost & Sullivan in 2018 with the North American Customer Value Leadership Award. For more information about Mitchell 1 products and services, visit the company’s website at mitchell1.com. Follow Mitchell 1 on social media at www.facebook.com/Mitchell1ShopSolutions and www.twitter.com/Mitchell1.